Darragh MacAnthony and his Spanish, Irish and UK versions of MRI Overseas Property have been the subject of significant media coverage over the past week or so. 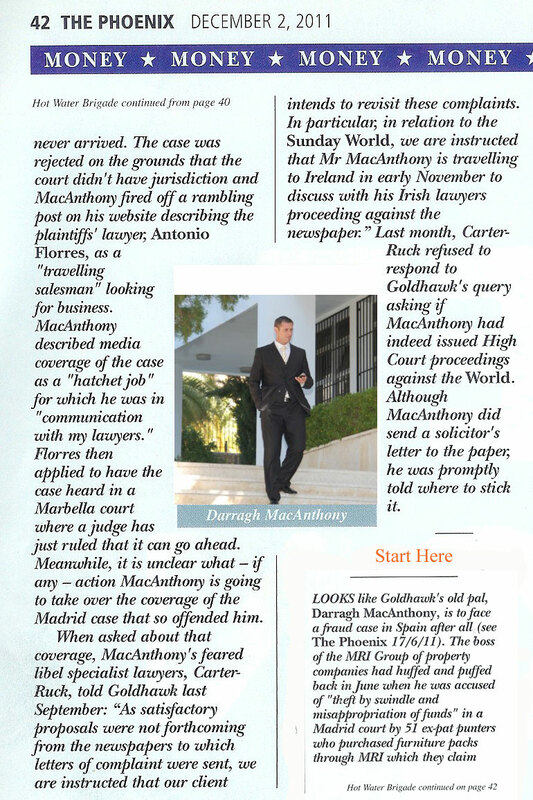 Along with the above article in Phoenix Magazine on December 2nd, 2011, an upcoming court case in Marbella has also been covered in the Olive Press (see here) and the Sunday Times last Sunday. MacAnthony, currently living in Orlando, Florida, is nowadays better known as the owner of bottom-of-the-table nPower Championship football club, Peterborough United. Along with ex-MRI Chief Executives Michael Liggan and Dominic Pickering he is accused of ‘Theft by Swindle and Misappropriation of Funds’ by 51 ex MRI clients who say they did not receive furniture for which they paid MRI. MacAnthony, Liggan and Pickering have consistently denied any wrongdoing in relation to the issues in question. MacAnthony has not responded directly to any of these articles, but did write in his blog, back in July 2011, about how he deals with what he termed ‘Extortion, Blackmail and Media Persecution’ – see here. Legal representative for MRI’s disgruntled clients, Antonio Flores, described by MacAnthony as a ‘small time lawyer’ and a ‘travelling salesman’, has put his version of the case against MacAnthony and his fellow MRI CEO’s on his own blog. The case is due to run in January 2012. The property developer Darragh MacAnthony is facing a criminal investigation in Spain after dozens of former customers complained that furniture they bought from one of his firms never materialised. MacAnthony Realty International (MRI) developed resorts in several countries and sold furniture packs to clients, 50 of whom filed a claim in Madrid in June. This group of Irish and British investors and buyers claim that €492,000 worth of furniture, ordered more than five years ago for apartments in Morocco, Bulgaria and Cape Verde, was never delivered. Under Spanish law, members of the public are entitled to initiate criminal procedure in some cases. The complaint was referred to a court in Marbella, where it was recently accepted. A judge will hear evidence from the claimants in January, then decide whether MacAnthony and five other defendants should face charges of “misappropriation of funds and theft by swindle”. Antonio Flores, the group’s Spanish lawyer, claims “many other” MRI customers are affected. He alleges that missing furniture is just one of the irregularities linked to MRI, or related companies such as MRI Overseas Property. Flores says that he is preparing a further claim, totalling €15m, on behalf of 200 Irish and British MRI customers. MRI has consistently denied any allegations of wrongdoing. In relation to undelivered furniture, the company has said the 2008 property crash forced several of its furniture suppliers out of business and it had to engage new ones — effectively paying twice for the same furniture order. But Flores claims at least two companies “were driven into insolvency by the ripple in the supply chain caused by MacAnthony”. MRI, headquartered in Marbella, became a giant in the holiday-home market prior to the global property crisis and made the 35-year-old Dubliner a multi-millionaire. It had hundreds of Irish customers. Among the claimants are John and Muriel Andrews from Ballycarry, Co Antrim. After talking to MRI at a Belfast holiday-home exhibition in 2006, the Andrews paid deposits on two apartments on the west African archipelago of Cape Verde. “Everything seemed to go well until a phone call from Global Home Services — a branch of MRI — who said we should buy their furniture if we wanted to be ready to rent our apartments,” said Andrews, 62, a retired doctor. The Andrews say they asked MRI to “snag” their apartment but were referred to Solutions Overseas property consultants, which told them the service would cost another €900. Solutions Overseas was registered to MacAnthony’s brother-in-law, Wayne Mottley. He is the husband of Wendy MacAnthony, who fronted MRI’s television-marketing campaigns, which was listed at a Marbella address two doors from MRI. In 2005, MRI’s recommended mortgage providers Capital Financial Partners (CFP) was transferred from the sole administration of Darragh MacAnthony to Mottley. CFP was also registered to the same Costa del Sol street. MacAnthony, the chairman of Peterborough United football club, didn’t reply to questions from The Sunday Times last week regarding either the companies recommended by MRI or the allegations of wrong-doing. Mottley did not return calls. The eagle eyed among you may notice that the picture that was originally in the middle of this piece in The Phoenix Magazine is no more, we’ve had to replace it with another. This is because we received a spurious DCMA (Digital Millennium Copyright Act) Takedown Notice from Darragh MacAnthony’s new lackey, Joe Dent, claiming that he owns copyright on the photo in question (It does indeed appear that Mr. Dent has way too much time on his hands). The DCMA Takedown Notice is much beloved of organisations and individuals that do not like the information that circulates about them in digital media. The Church of Scientology, for instance regularly uses the Act to remove articles about it that it does not like from around the Web. Joseph Dent, 91 Wesleyan Road, Dogsthorpe, Peterborough, Cambs, England, PE1 3RX. Mr. Dent, it appears, is a bit undecided as to where he currently lives, this takedown notice was delivered from the address of Peterborough United at London Road. We’re contesting the DCMA due to it being the spurious effort that it is, but we’ll leave the picture as it is as a reminder of just what we’re dealing with when it comes to this individual. Detroit Bargains May Be a Steal – But for Whom? This man seems devoid of any sense of guilt. My brother (a very hard working, honest, salt of the earth Irish guy unlike Mr MacAnthony) fell into the Darragh MacAnthony MRI trap and purchased an apartment. Invested in this apartment for the future of his two children rather than investing in a pension fund. He can’t afford to take action against Darragh MacAnthony and his company MacAnthony Realty Investment (MRI). He sent €9,000 euros for furniture which he never received and is now in the process of paying a solicitor to represent him in court in Bulgaria to prevent the apartment being sold eventhough he is the rightful owner, has paid in full and holds the Title Deeds or at least that was he was led to believe. I just hope Darragh MacAnthony sleeps well at night because my brother doesn’t worrying over what he lost or might lose. There is no place in Ireland for someone who rips people off and robs them of their dream.